Sarawak is the largest state in Malaysia and is definitely a great place that offers tourists an amazing list of fun-filled and exciting tourist destinations. The capital of the city is Kuching which gets its name from the smallest member of the cat family the cat itself. The city was really named after a stream called the Kuching River than originated from Cats Eye Hill which has plenty of the local fruit called Cats Eye or Mata Kuching in the Malay language. If you are in Kuching, the one place that is a must-visit is the Cat Museum. It certainly is an amazing museum to start out your journey in Kuching as the museum gives you a greater insight into the history of the city. Initially, the gallery that is being displayed at the Cat Museum here was shown at the National Museum in Kuala Lumpur as a small gallery. 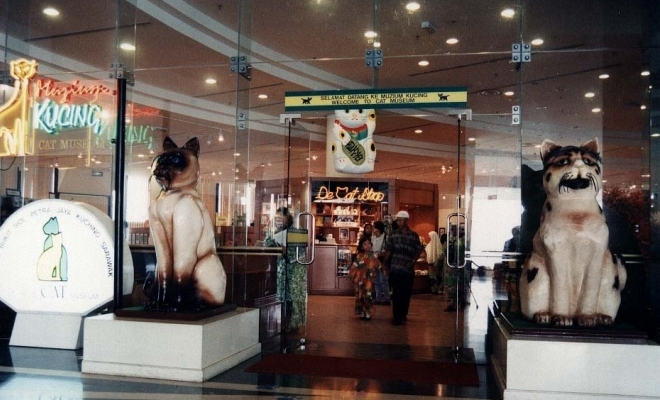 Then, when Kuching was given Cat City status, the gallery shifted here and the museum opened its doors to the public to showcase the beauty of cats. The museum is also a great place for cat lovers and those who are interested in doing some research about the smallest member of the cat family. The museum stands majestic on top of the Bukit Siol hill and claims a majestic view of the city of Kuching. The museum is not very large and houses four main galleries. Here you will find many cat artifacts from across the globe. The museum takes you on a journey to study the history and evolution of these feline creatures that have survived throughout the ages. The museum showcases the many historical and social roles the cats have played from the grand kingdoms to your living room. The museum is definitely very visitor friendly and tourists will not find themselves lost in the wealth of information on showcase right here at the museum! Do take some time to read some of the very interesting legends that involve cats. You can even meet up with the more famous cats on TV like Garfield and Felix right here! There is also a small section of the museum that showcases cats in the media and how cats are used to advertise for food products as well. Once you are done touring the museum, why not take a look at the gift shop. There are many interesting products to be found here ranging from key chains, stationary, cat pendants, stamps, postcards and t-shirts, so do take home with you a memory of your trip into the cat museum!